Since it’s ‘flashback Friday’ otherwise known as ‘FBF’ on social media, we decided to take you back to last week’s blog post on the exciting things that we, at WCE, have in store for 2015. We just wanted to give you a quick update because in the last week we have been to the Alphe Conference held in sunny Málaga and have met lots of potential partners/collaborators that could offer our students very exciting opportunities. 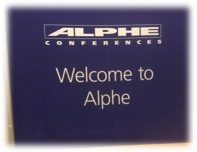 We have been to the last few Alphe conferences held in the UK but this was the first time that we had attended an Alphe conference in Spain. So what exactly is it and what happens there? Well, Alphe conferences consist of face-to-face meetings, which last up to half an hour each between agents (like us) and educators (schools/colleges). Alphe is the perfect choice for agencies that are trying to recruit or expand their international student base. This is exactly what we’re trying to do at WCE. Not only would expanding our connections benefit us but it would also benefit our students and partners!! (a sort of 3 in 1 that keeps everyone happy). Alphe presents the perfect opportunity for this because as you may have understood already, this represents a wide network of conferencing events across the world. By worldchoiceeducation in Uncategorized on January 23, 2015 .